Kendesnii Campground, formerly known as Twin Lake Campground, on Nabesna Road; one of our favorite wilderness road in Alaska. Find the options for Wrangell Saint Elias National Park RV Parks and Camping Areas. 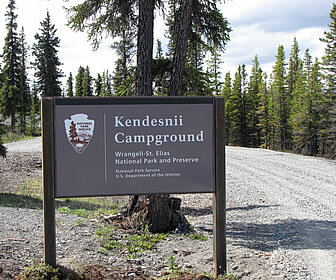 Kendesnii Campground at mile 28.2 is the main camping destination along the Nabesna Road in the wilderness of Wrangell-St. Elias National Park and Preserve. Kendesnii Campground, formerly known as Twin Lake Campground, offers 10 rustic campsites with picnic tables, fire rings, bear proof garbage containers, small boat launch and a private setting that provides a very nice camping experience for camping. Some sites are adequate for larger RV's. Campsites at Kendesnii Campground are on a first-come, first-served basis and the free fee is something spectacular too. There are additional sites near the shoreline of the lakes accessed by the short hiking trails from the campground. Kendesnii Campground offers a great family destination with canoeing, wildlife and waterfowl viewing plus some good fishing for grayling too. Firewood is available at Sportsman's Paradise Lodge next to the campground. Directions – Kendesnii Campground is located 28.2 up Nabesna Road from the intersection with the Tok Cutoff near Slana, AK. Description – This is a semi-rustic campground with 10 rustic campsites. The campground has been upgraded with new gravel, outhouses and more. Kendesnii Campground is in excellent shape.